Cassie plays with her cousin during her 5th birthday party in Parkersburg, West Virginia. The birthday was important for the Jordan family as it marked Cassie's first year cancer free. Cassie peers through the seat the bus that she and her mother, Kristina, take to the grocery store. Cassie was diagnosed with retinoblastoma at 19 months old, a rare form of eye cancer that begins in the retina. Cassie’s eye had to be removed six months ago and replaced with a synthetic eye. Since then, Cassie has successfully battled the disease and is officially in remission. Retinoblastoma is a hereditary cancer that has been passed down three generations in the Jordan family. Cassie was passed down the disease from her father, Sean, who received the disease from his father. Cassie laughs on the floor of her bedroom with her parents, Sean and Kristina Jordan. Kristina, Cassie’s mother, also has sight issues, although not related to retinoblastoma. She has limited vision in her right and is legally blind in her left eye. Kristina calls a cab after the family’s monthly trip to WalMart. Due to Sean and Kristina’s sight issues, the family struggles with transportation and can rarely leave the house. Cassie plays with her shadow while her grandmother, Rayanne Powell, smokes a cigarette. 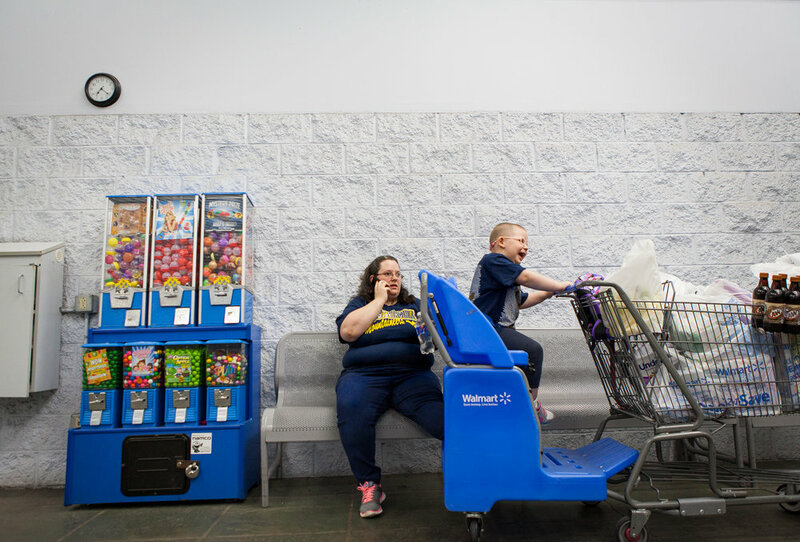 The pair wait for the bus transfer in Parkersburg, West Virginia as they make their way to WalMart. Due to combined sight issues and a low income, the Jordan family must take public transportation wherever they go. Sean Jordan teaches Cassie how to strum the guitar in their home. Sean passed down his love of music to Cassie who is learning how to play piano and guitar. Sean had both of his eyes removed 14 years ago but continues to be a musician of multiple instruments including drums, guitar and piano. Cassie cuddles with her dad, Sean, also a survivor of retinoblastoma. 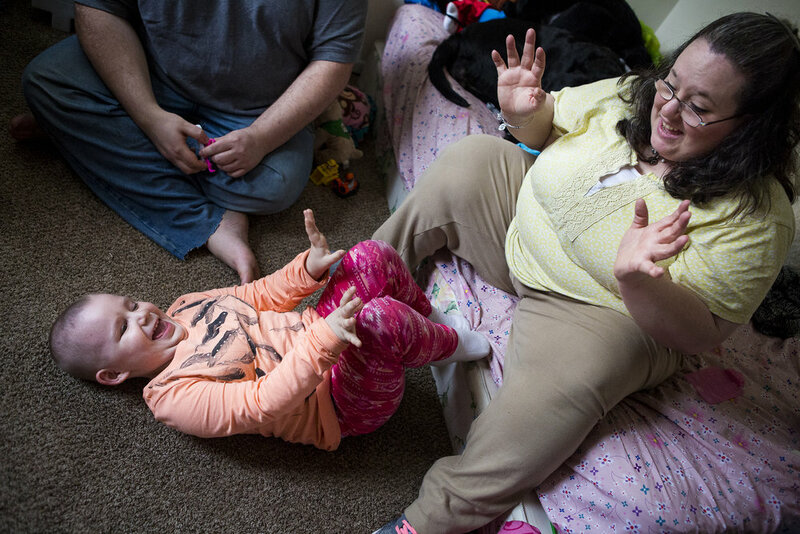 The pair share a special bond having both battled retinoblastoma. Cassie waves goodbye to Pastor Henderson after he drops them off at their apartment complex in Parkersburg, West Virginia. The church drives the family back and forth from their home so they can attend the Sunday Service.